The cicadas drone on and on in the trees on this last day of August. The windows are open. I feel the heat starting to build up in the house, and know I will have to turn on the air conditioning later this afternoon so that the upstairs will be bearable at bedtime. Yet I love the fresh air filling the house. Laundry fills the washer and dryer as I prepare for a trip to Iowa. The first time I brought my husband to Iowa, the state where I was born, he was amazed at how beautiful it was. Instead of the flat farm fields and far horizons we have in Northern Illinois, rolling green hills cover Iowa. While I never actually lived in Iowa (but wait, weren’t you born there? you are thinking) I visited my grandparents in Iowa often as I was growing up. I was born in Iowa but my parents lived across the border in Nebraska. 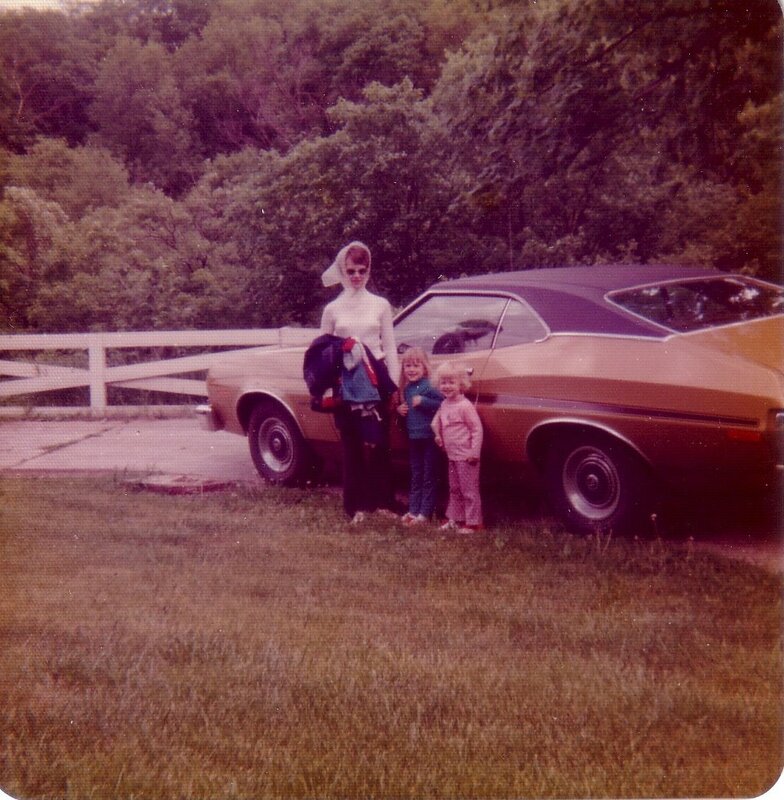 As kids, we knew we were getting close to Grandma and Grandpa’s when we started driving up the road next to the river. Shortly after that, we would turn onto Grandma and Grandpa’s street and start driving up the hill to their house. Up we would go until we got to the last house on the street. We would park in the circle driveway in front of the house and run up to the door. My mom’s parents were the only grandparents I knew. Both my dad’s parents died before I was born. Grandma was born in 1918, and was just a baby when The Great Pandemic swept through the United States. She survived the flu, but one of her brothers did not. Grandma was very proud of the fact that she had finished high school; she grew up in a time when many people didn’t continue their education. When she was 19 years old, she married my grandfather who was 9 years her senior. Together they made ends meet by working in an airplane factory during WWII, selling WearEver pots and pans, and a variety of other jobs. She loved having great-grandchildren, and during her last few years would proudly walk with Lily and Emmy down the hallway in her assisted living building. She was one of the first people to move into an apartment after the building was finished, and she loved helping the “older people” who arrived. In fact, being almost 90, Grandma was probably one of the oldest people living there. I don’t know that she ever considered herself to be old. I still remember her sitting in front of my mom’s casket; just sitting with her grandchildren. Less than two months later she fell and broke her arm and just couldn’t recover. Numb with grief over the loss of my mother, I didn’t mourn the loss of my grandma properly. I pushed my emotions away and busied myself with the tasks of motherhood. And so eighteen months after her death, it is still hard to remember that we won’t be seeing my grandma during this trip. I’m holding a tight rein to my feelings of grief as I remember Grandma’s laughter and her way of telling a story; to her generosity and her determination. I’m holding on tight to a grief I’ve barely given myself permission to feel — and letting it go gently as I tell my daughters about the love their great-grandmother had for them. Visit Sarah at This Heavenly Life for more Intentional Living through Simple Moments. Oh Ginny, this post really struck something within me too. My situation was kind of similar. I was born in ND and never lived there. Every summer I visited my grandparents there and some of my great memories are of those times. My grandma was one of the most influential people in my life. She taught me what unconditional love was. I still miss her. It must have been heart breaking to watch your grandma grieve for your mom. Anyway, sorry to ramble. I hope that first trip back wasn't too tough. Thanks for the post. I loved this. Our grandmas sound a lot alike. Mine was born in 1913 and lost her mother to Influenza when she was just a baby. She had six brothers and sisters and her father's sister came to help raise them. Ginny, I feel so blessed to have read this piece about your childhood and your memories of your grandma. I know what you mean about not fully having grieved the ones we love and then clinging tight to the memories that flood your mind during times most unexpected. Permission to grieve. Yes. I think I need to grant that to myself, too. Thanks for sharing this. Your writing is so beautiful and always seems to bring memories back for me too. My grandma would never say "I love you," either. She, too, always said, "Mmmm-hmmm" Later in my life, I would say, "I love you" to her on the phone and one time she said, "Yeah, uh-huh, love you too. Bye. "It was like some kind of miracle! You really hit me with this one. My grandma is sick and I am dreading the emotions I will have to deal with soon, or at least some day.BTW, I am proud of her for finishing high school too. 🙂 Great accomplishment during that time period. There is something about being at a distance that does let your mind "fool" you from time to time. I am thinking of you saying it is hard to remember that you won't see her this time. My father-in-law has been gone for several years and from time to time I have to remind myself that he isn't just a state away. I think that maybe the grief seeps in a little more gently that way. Oh Ginny, it sounds like it has been so difficult for you! I still have days and moments when I mourn the loss of my own Grandma. She made such a difference in my life. 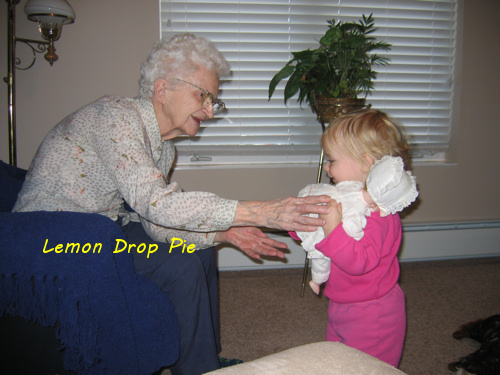 I would use this weekend to tell your own children your favorite stories from your Grandma. That will help them to remember her anew through your eyes. I can totally understand how it would have been difficult to mourn the loss of your grandma when you hadn't finished mourning the loss of your mom. (But do we ever finish that?) I'm sure this trip will bittersweet this weekend. I send you off with big virtual hugs!